I really enjoyed Emily Liebert's first novel YOU KNEW ME WHEN -- you can read my review here. I appreciated the way this book explored female relationships, and I was impressed with Ms. Liebert's character development. 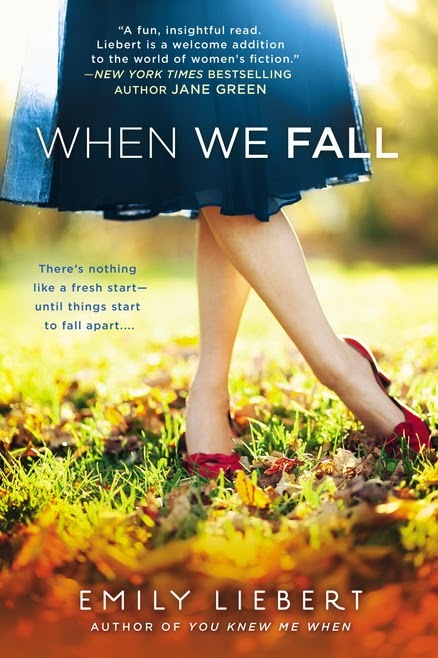 Her second novel, WHEN WE FALL, titled was released just this week; and naturally, I was very excited to read it. After finishing WHEN WE FALL in just a day, I can honestly say that Ms. Liebert has a knack for delving into the complexities of women and bringing her characters to life! WHEN WE FALL begins with Allison Parker returning to her hometown in the suburbs of New York City. Allison needs a fresh start with her young son after the unexpected loss of her husband, and she has the support of her parents so she can focus on painting as a career. Despite growing up here, Allison feels like a bit of an outsider... especially as it relates to making friends with the other moms. To everyone, Charlotte Crane has it all. She's married to a great guy, has an adorable little girl, never has to worry about money, and is surrounded by close friends; however, looks are deceiving. Charlotte's marriage is in trouble, her daughter is difficult at times, and her sister is a major thorn in her side. In addition, her friendships aren't exactly "real." So when Allison arrives in town, Charlotte is in need of a friend and reaches out to her. Much to everyone's surprise, Charlotte's husband Charlie was best friends with Allison's husband; and he feels an immediate affinity with Allison. Charlotte becomes concerned as Charlie spends more and more time "helping" Allison. As of Charlotte's insecurities rise to the surface as she begins to see the truth about her life, and Allison struggles with her attempts to move on as a single mother. Can these two women find comfort in their new friendship, or will it cause both of them to doubt their choices? I enjoyed WHEN WE FALL quite a bit. I'm not sure I enjoyed it quite as much as Ms. Lieber's first novel, but I did read that one while vacationing on the beach -- so maybe it's not a fair assessment. At first, I thought this novel might be a bit predictable; and I wasn't sure I was going to like Charlotte at all. However, as I became more involved in Allison and Charlotte's lives, I discovered that I truly cared about these characters; and I was very caught up in the drama between them. Once again, I was quite impressed with Ms. Liebert's ability to create realistic women as well as to capture the relationships in their lives. Initially, I thought Charlotte might be a bit flat and one dimensional; however, I quickly put that thought to rest as I learned more about her. Despite seeming perfect, she was filled with insecurities about her husband and her relationships with her family and friends. I felt as if the author made a point that everyone, including those who seeming in have it all, have "issues" and that it's not fair to judge based on appearances. As an extension of really liking Allison and Charlotte, I definitely appreciated how the relationship between them was portrayed. The author did a great job of capturing the clique-y moms and how difficult it is to enter their circle (sometime I wonder if we ever mature past middle school behavior! ), but she also featured some other unique aspects of female relationships. The primary relationship explored was Allison and Charlotte's special friendship, but I also enjoyed seeing how the "second tier" relationships played out. I found Charlotte and Charlie's marriage -- both the ups and the downs to be interesting as well as Charlotte's extremely complex relationship with her sister. WHEN WE FALL is perfect for book clubs since so much of it focuses on female relationships. There is a reading guide included in the back of the book; however, I wasn't able to find a link on-line. Some of the topics you might want to discuss include mean girls, jealousy, marriage, loss, grief, parenting styles, new starts, sister rivalry, friendship, secrets, and forgiveness. I have a feeling that many women will appreciate discussing the school moms, and I'm relatively confident that their behavior will resonate with a few members! And here's something kind of neat... an important part of WHEN WE FALL takes place at Canyon Ranch, the famous luxury spa which offers integrative wellness programs (http://www.canyonranch.com/). 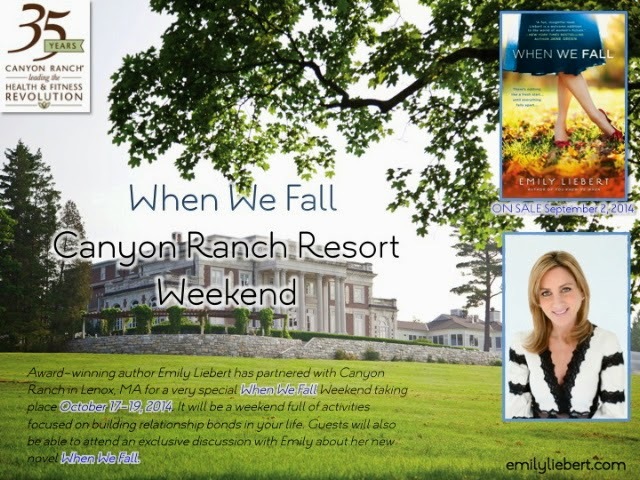 For the release of the novel, Ms. Liebert has partnered with Canyon Ranch in Lenox, MA for a very special When We Fall Weekend taking place the weekend of October 17-19, 2014. It will be a weekend full of activities focused on building relationship bonds in your life as well as an exclusive discussion with the author about WHEN WE FALL. WHEN WE FALL is an entertaining book that focuses on female relationships. Recommended to fans of women's fiction and book clubs. Thanks to Sarah Hall Productions, Inc. for providing a review copy of this novel. It really does sound like there's a lot to discuss with this book! I doubt I could get my book club to read it.